Weary in many ways, we walked into the church service yesterday and were greeted by a group of precious elementary aged children singing Jesus Loves Me. It had been so long since I'd heard those words, or rather, since I'd really listened. Their sweet introduction led the congregation into Tomlin's worship song with the same title, and I fought to hold the tears back. Sometimes life just feels like a fight, and without the proper fuel and armor, we are left naked in the battle. I was fueled by that simple reminder of God's love, and ironically, didn't hear much more of the service because I was not feeling well. God knew that, of course. What is the genesis of this joy? 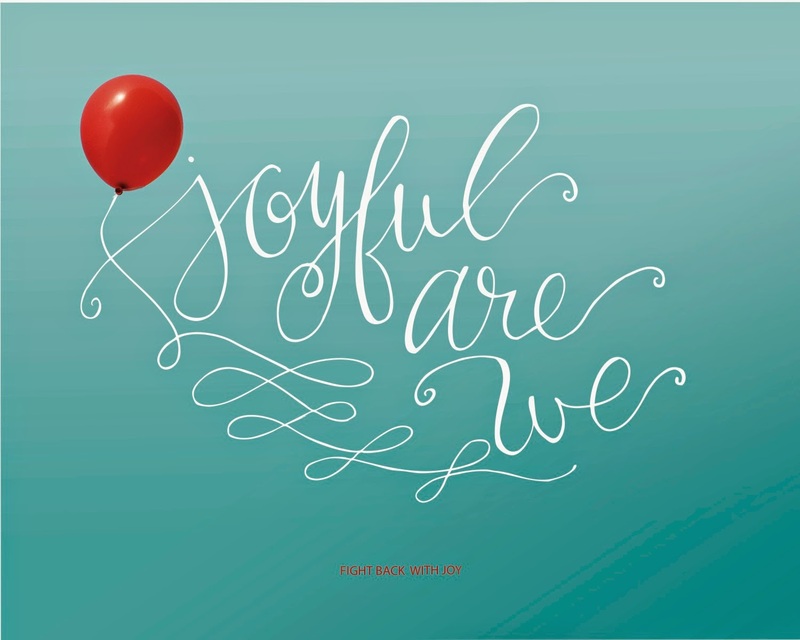 I believe that, at its core, joy emanates from the abiding sense of God’s fierce love for us….When we embrace this love and cultivate an awareness of it, our hearts are filled with joy. Such awareness strengthens our resolve that no matter the fight, we face it confident that God is with us and for us. When we fight back with joy, we no longer size the character of God according to our circumstances, but we size our circumstances according to the character of God and his great affection for us… When we fight back with joy, we embrace a reality that is more real than what we’re enduring and we awaken to the deepest reality of our identity as beloved, joyful children of God." I couldn't agree more! I have fought this battle to embrace God's love. In fact, it's at the core of my story. Letting go of my perfectionistic tendencies, and finding my hope and help in Christ, rather than my own abilities, has changed me body, mind and soul. No longer must I find my confidence in what others think of me, my achievements, or any other shaky ground. The firm foundation of God's love is the basis for the joy I experience now, and that can never be shaken. I am a firm believer in the holistic nature of our body, mind and spirit, and passionate about encouraging women (and men) to pursue health and vitality that will encompass every part of their being. Joy is no small part of this pursuit towards wellness. The author knows this quite well, as she details in her book. She chose JOY to lead her fight against a cancer diagnosis, and surprised many at what a profound impact that choice made. We are not guaranteed health and wellness simply because we follow Christ, however, choosing to fight for joy can be one part of the remedy that leads us back to health in body, mind and soul. Many of you may not believe that joy is a struggle for me, as I'll most likely greet you with a huge smile and a big hug, and have been told on numerous occasions what a joyful person I am. Hearing those comments brings ME joy, because it doesn't come easy. For any of you who have faced painful trials, you know the real depth of darkness they bring. I am not a stranger to that darkness. Perhaps you are in that place now, whether it is brought on by physical issues, life circumstances, or a struggle of faith. It is so easy to give in to despair when life is hard, instead of seizing the day or rejoicing in the Lord, as the Word commands on numerous occasions. A former pastor often reminded us to avoid the Eeyore - Christian mentality (Eeyore is the pessimistic, stuffed donkey friend of Winnie the Pooh, if you're not up on children's literature :). In the words of C.S. Lewis, "Joy is the serious business of heaven." Our response to what life throws us will not only affect our lives, but those of onlookers. 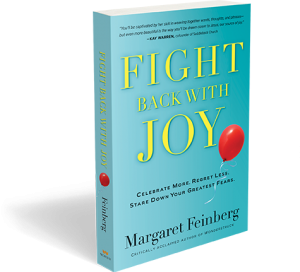 But don't take my word for it... pick up Feinberg's book, and dive into the meat of her search through hundreds of Scriptures on joy. As Feinberg says, "Joy is more than a feeling; it's an action. We don't just sense joy; we embody it by how we respond to the circumstances before us." If you're facing any kind of darkness, or know someone who is, I'd highly recommend you pick up this book! Let that be your first action in the fight for joy. And then join me (and the author) in spreading that joy everywhere you go... it's contagious and irresistible! Find Fight Back with Joy on Amazon or Barnes and Noble. Or click here for the 6-session DVD Bible study, sure to encourage and inspire!